Installation view: Selections from The Animal Series at Nirox Project Space, Maboneng Johannesburg, February 2013. 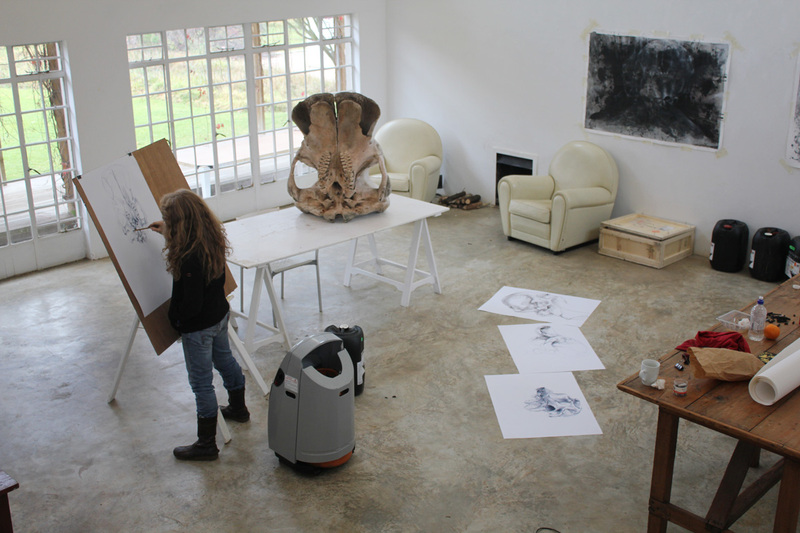 This series of individual and collaborative artworks give artistic form to my material encounter with an African Elephant skull through a variety of mediums including drawing, video, photography, etching and sculpture. I have long been fascinated by English sculptor Henry Moore’s work drawn from his observations of an African elephant skull. In 2013 had the opportunity to study the series of etchings firsthand at the Tate Britain and wanted to rethink the human, artistic encounter with the skull. However, other than Moore I am not interested in a mostly formal exploration of the skull. I felt a need to highlight the material particularity of the corporeal encounter with the elephant skull. In simple terms, I wanted to know how my physical body relates to the skull – materially and conceptually. 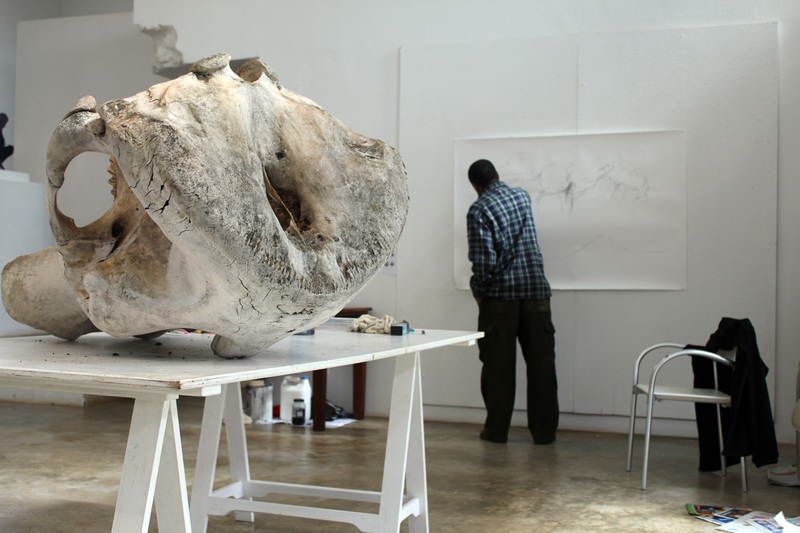 During the course of a 2013-14 I created a body of artworks that investigate, document and give aesthetic shape to my personal encounter with an African elephant skull. This body of work is collectively known as ‘The Animal series’ and it includes drawings, photographs, videos, sculptures and etchings.Throughout this project the material encounter is key: that means that throughout the production of the Animal Series I am interested in tracing the exact material manner in which I physically encounter and make sense of the elephant skull. In this regard the series of works is marked by the attempt to render in artistic form a complex set of material relationships that include those that exist between human and animal, animate and inanimate material, memory and loss, touch and sight, flesh and bone. For the project I have also collaborated with a number of South African artists including Diane Victor, Willem Boshoff, David Koloane, Guy du Toit and Bevan de Wet. Each of these artists have, by way of their particular artistic approach helped to expand the repertoire of possible artistic, conceptual and socio-cultural implications of the encounter with the skull. Selections from ‘The Animal Series’ have been exhibited on a number of separate occasions in South Africa. As part of a solo exhibition held at the Nirox Projects in Johannesburg in February of 2014. As part of a group exhibition ‘Working title’ held at the Goodman Gallery, Johannesburg, 2014. As part of the Annual Sculpture Fair at the Nirox Sculpture Park in the Cradle of Humankind, Krugersdorp, also in 2014. 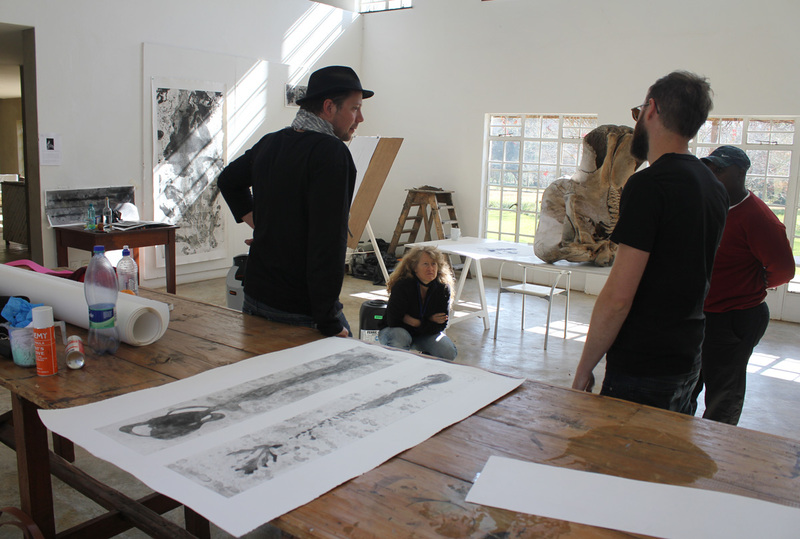 From left to right: Johan Thom , Diane Victor and Bevan De Wet discussing the project at Nirox.